Zack Snyder pushed digitally enhanced movie-making into a new dimension with 300 (together with many brilliant CG artists, of course). Here he tackles another highly respected graphic novel (by Alan Moore and Dave Gibbons) and turns the super-hero cliché on its head with skull crushing impact and amazing visualization. With an alternate history (including Nixon still president), a masked group of justice distributors (which the authorities would label vigilantes) known as Watchmen take care of problems the police can't. Having started many decades before, the torch gets passed on by these characters once they've aged too much to be effective. But now, they are systematically being killed off. The tale is narrated by Rorschach, a voracious opposer of crime and evil, and gets in contact with the remaining heroes to warn them. These men and women live relatively ordinary lives, except for Mr Manhattan, a nuclear scientist whose body was altered by an accident, giving him amazing powers. A global threat looms with American and Russian nukes on the brink of being launched, a dark plot being hatched involving the Watchmen. While most of these heroes are dedicated to righteousness, some of them are extremely flawed personalities capable of shocking acts. 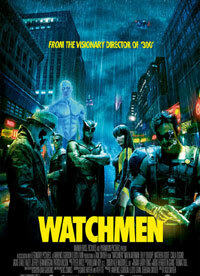 Watchmen is one spectacular motion picture. This single disc release is unfortunately low on extras, and only includes an interesting piece analyzing the world of the Watchmen and its possible basis in science.